Nouvelle publication d' Elie Vignac, Pascal Lebihain et Bastien Soulé dans International Journal of Aquatic Research and Education portant sur les problèmes de quantification des noyades en piscine publique sur le territoire Français. Abstract : Regarding risks associated with activities of daily living, recreational activities tend to be major sources of domestic risks in France. We focused on fatal drownings in public swimming pools, intending to quantify them. 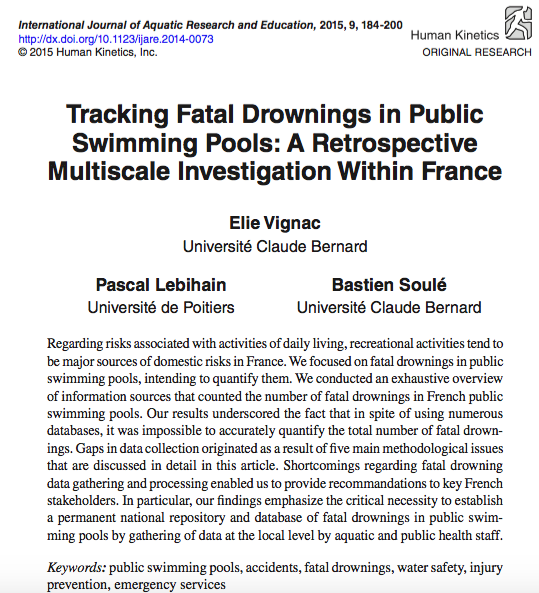 We conducted an exhaustive overview of information sources that counted the number of fatal drownings in French public swimming pools. Our results underscored the fact that in spite of using numerous databases, it was impossible to accurately quantify the total number of fatal drownings. Gaps in data collection originated as a result of five main methodological issues that are discussed in detail in this article. Shortcomings regarding fatal drowning data gathering and processing enabled us to provide recommendations to key French stakeholders. 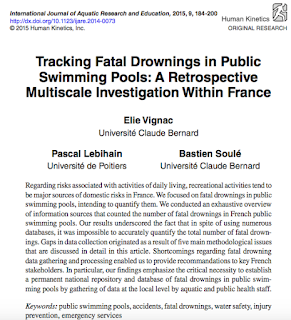 In particular, our findings emphasize the critical necessity to establish a permanent national repository and database of fatal drownings in public swimming pools by gathering of data at the local level by aquatic and public health staff.